An echocardiogram (echo) is a cardiac test that uses high frequency sound waves (ultrasound) to create pictures of your heart’s chambers, valves, walls and the blood vessels (aorta, arteries, veins) attached to your heart. The test is also called echocardiography or diagnostic cardiac ultrasound. 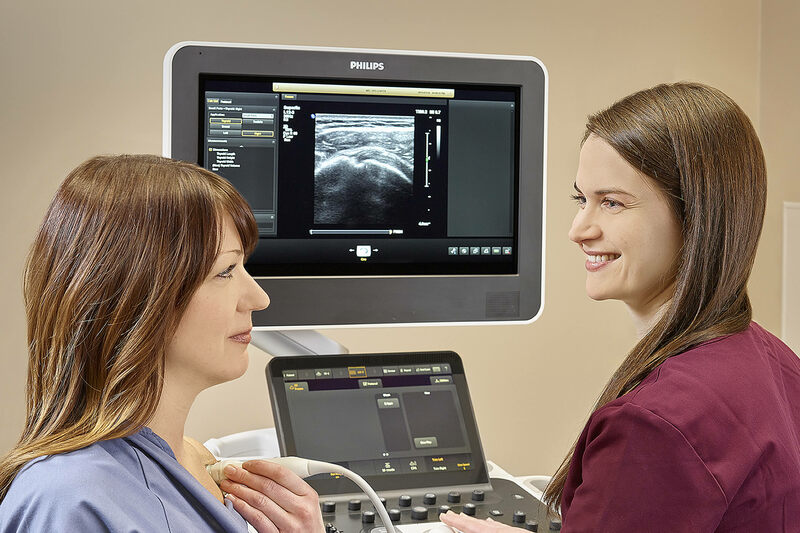 During an echocardiogram, an ultrasound technologist will move a transducer (probe) over your chest. The transducer is a unit that produces sound waves that bounce off your heart and ‘echo’ back to the probe. These waves are changed into pictures viewed on a video monitor. An echocardiogram is a simple, painless test. Before your exam begins, our technologist will place small electrodes on your chest. Our technologist will put a warm, unscented, water-based and hypoallergenic gel on your chest. This gel helps the sound waves pass through your skin. The exam room will be dimly lit to make it easier for your technologist to see the images of your heart on the ultrasound television monitor. The technologist will move the transducer or probe across your chest. A typical test takes about 15 to 45 minutes. An MIC radiologist will review the images and provide a complete report to your practitioner, usually within 24 hours.